Tuesday. 10am. I picked up the phone. “Darling….when you get home tonight the house might look a little bit different….” I said. “Different how?” S asked, voice assuming a mildly panicked tone. “Well….you said you were getting stressed seeing the frame wall unfinished,” I explained. Seeing it, he’d said, was a reminder of all the jobs he had left to do…. though blame for it’s perpetual state of incompleteness could hardly be placed at his door. My indecisiveness has paralysed the process. And during this extended paralysis my ever-growing charity shop frame collection, peppered with Ikea Ribba purchases gathered supermarket-sweep style at recent visits to the superstore, have resulted not in artistic arrangements on the wall but rather somewhat slidy configurations stuffed behind doors. Frame landslides clattering against human shinbone have been an almost bi-weekly occurance for the last two years. Yes. Depressingly that really is how long this particular project has been on the go. And so I’d decided enough was enough. I said as much to S. I think I heard a sigh of relief. The colour I’d chosen for the wall was probably, black aside, one of the darkest available. I’d opted for Down Pipe for a couple of reasons. The first being it was the colour I’d used originally to pick out the architraves and I no longer liked the contrasting look of the dark doorways against the white walls. Slapping the walls with it too meant no extra paint or time needed to be spent seeing to the woodwork. (Though honestly, when has extra paint or extra time ever deterred me once a bee is truly ensconced within my bonnet?) Secondly it went well with the Fired Earth tiles and stair carpet and last but not least it’s the colour I’ve used on the garden walls and I thought it might look good to have consistency as you look through the house. A fourth reason, one that I kept even from myself, was that the task of painting would enable me to procrastinate just that little bit longer. 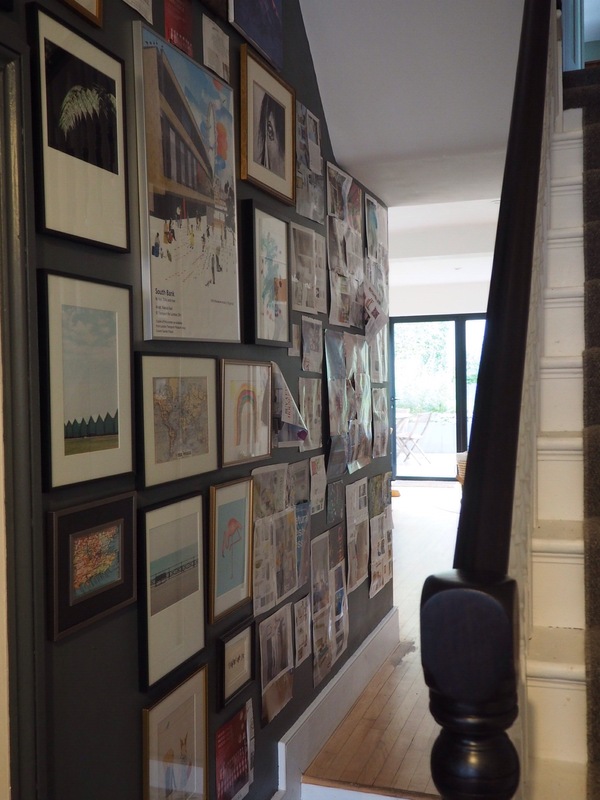 I’d been feeling a bit overwhelmed by the whole gallery wall thing…..refurbing the charity shop frames, replacing mounting card then figuring out what was to go within them. That said I’d made some baby steps and a small configuration had been mounted on the left hand side of the wall. From that brief exercise I’d learned the hard way to avoid any frame with yellowing tape on its rear side. That probably means that old fashioned pins are holding the backing card to the frame and once levered out are hard to get back in again…hence the numerous frames propped against the wall which spill their glass at the merest whisper of movement nearby. I also had a fair few frames with mounting card which needed refreshing and in those instances I’d discovered that painting the card in emulsion worked rather well. Finally there were frames which were without, but in need, of mounting card and a recent discovery, a website called EzeFrame, had made preparing those for my images a rather stressfree process. Measurements and preferred colour are entered online and mount is posted in exchange for only a few pounds as opposed to the ludicrous £18 I was charged at the local framers. And with the content theme now sussed…..holiday landscapes downstairs, us both being keen yet very inexperienced amateur snappers (the noun ‘photographer’ assumes far more technical knowledge than we possess) and childrens artwork plus a few family photos upstairs… there really were no more excuses. So with Baby A asleep I set to it. Working fast to make the most of his slumber I managed to complete one coat downstairs before I needed to collect O. I glanced at my handiwork and gulped. It looked almost black and with it still needing a second coat my reassurances to S that it wouldn’t look as dark once colourful photographs were hung could not be proven before his return home. He’d hate it, I’d thought, when he sees it in its naked state. I called him. “It’s more dramatic than dark” I ventured. “Don’t worry pet. I don’t care.” was the dismissive reply from a man I can’t help but love…his tolerance of me being one of the many reasons. The next weekend friends arrived for dinner. They stood perplexed in the hallway. A couple of weekends later, clustered in our kitchen, I recounted the story of a paintbrush wielding wife and her ever patient husband to another group of friends. “Have you painted the hallway grey? I didn’t notice…..” they said and trooped out to look. “Oh yeah!” came their unified response. This week I recounted that story to my mum who had arrived for a week’s visit and would, undoubtably, spend some of it painting. 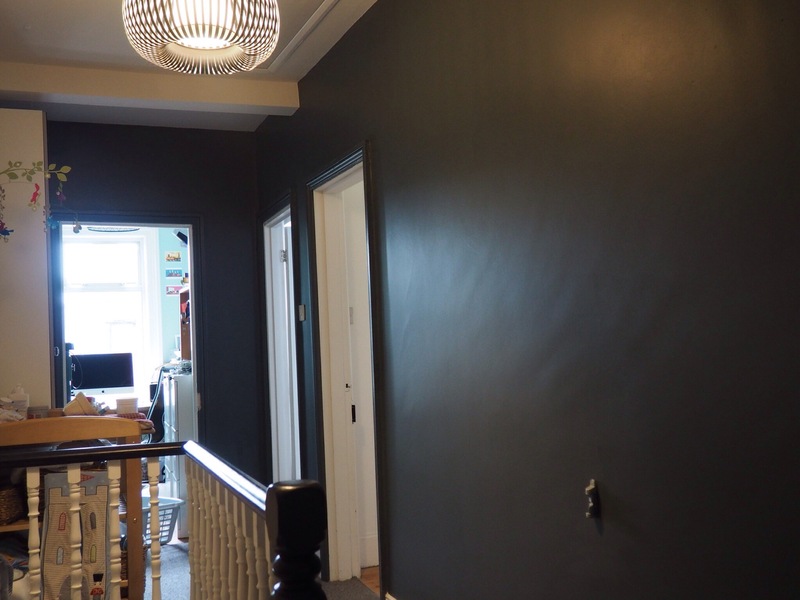 “I was worried I might have gone too dark but given that no one seems to have noticed I may as well go the whole hog and paint upstairs grey too” I declared. The moral of this story is ……daring to go dark doesn’t require much dare at all.Now, I might claim it’s because the colour is just so very right that it blends in with its surroundings so beautifully and looks so naturally like its just meant to be there that it warrants no comment. But in fact, if the change is imperceptible, it probably just begs the question as to whether the effort was required at all. Nevertheless the varying underwhelmed reactions propelled my decision to extend the colour up the house and my mum and I, this week, completed the rest. And the verdict? “I love the new light, mummy” announced O, noticing not the new colour but the pre-existing fitting. “More dark…….” sighed my husband. Help! The link doesn’t work! I love it! I’ve been dreaming about painting our lounge Hague Blue but the plethora of naysayers sowed a seed of doubt in my mind and now I’ve lost the impetus altogether – gah! Oh go for it! I paintedourbedroom Stiffkey Blue and I love it, though prob would like Hague Blue even better. On,y thing I regret is not painting the ceiling too…I wish I’d gone the whole hog as I think it would have looked fabulous and covered up our cracking, slightly wobbly ceiling! And here I actually did it.. 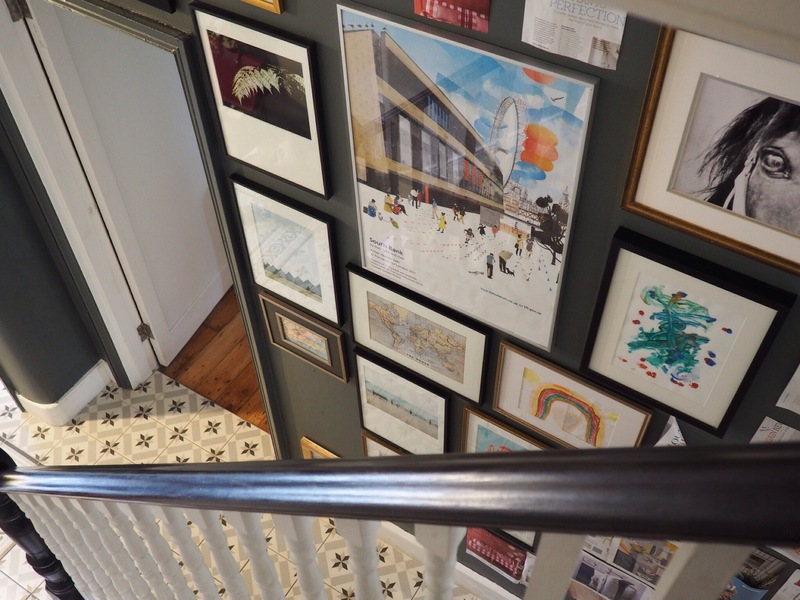 Check out abigail Ahern’s blog, she always advocates doing the ceiling too…. I’ve never tried it…but wish I had. 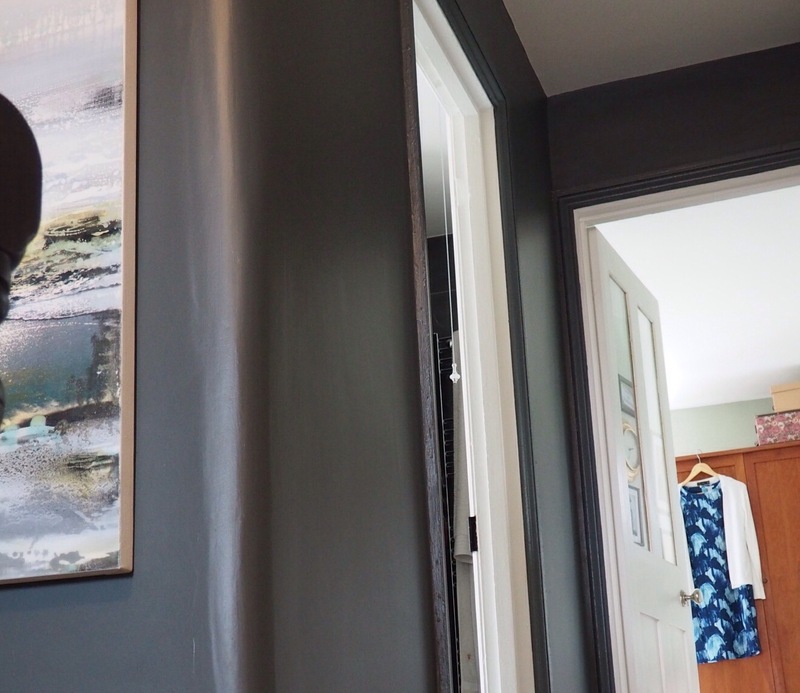 A word of caution about painting ceilings – I bought into the whole Abigail Ahern thing and whole heartly painted my bathroom walls (it’s half tiled) and ceiling dark grey (Valspar Sooty Lashes which is roughly F&B Railings). I finished it at 11pm at night and was absolutely delighted, it looked so dramatic. Next morning, in the bright light of day, I first spotted the gloom the open door cast out onto the landing, the room was like a cave! There was barely enough light for me to see my own hands. So, not wanting to have to switch the light one everytime I needed the loo, I painted all back to white! And it didn’t cover easily. I think you can get away with it in big rooms with lots of natural light (like Ahern’s) or maybe in rooms where seeing is not a requirement but my little north facing bathroom with three tiny windows was not the spot to try it. That said, I’m painting my living room (south facing with an enormous window) Hague Blue next week but I don’t think I’ll dare go higher than the picture rail! Good luck anyway! Just catching up on blog reading and enjoying seeing your adventures. I absolutely love Down Pipe but I only have one wall in it. I’m guessing you’ve used Modern Emulsion as I can see a bit of a sheen. I used the Estate Emulsion. 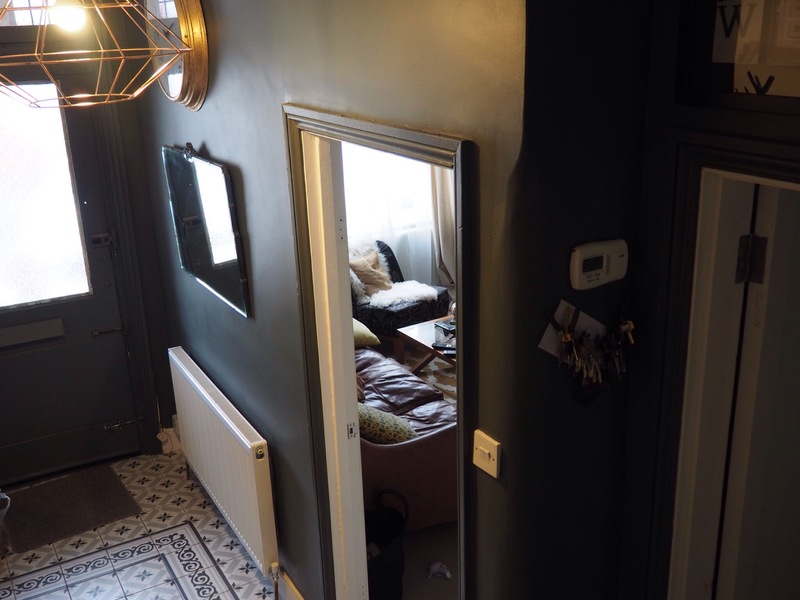 As for ceilings, I painted my bathroom which is tiled 2/3 of the way up (in cream) in Elephant’s Breath and it worked beautifully but it is quite dark despite being a very light room. I don’t think I’d do the ceiling in any shade darker than that! Ah that’s a thought… Elephants breath a great choice. Yes I used modern…I was told by the staff that it would be more hard wearing but it was trickier to apply.